Have you ever felt like you've hit a brick wall? You muster up all your strength and energy to break through that barrier, but in the process you’re getting scraped and bruised and not really getting closer to what you want? You might have heard advice like, “quitters never win”, or “what doesn’t kill you makes you stronger”, or other ideas about perseverance, completing everything you start, or working harder to get what you want. You can walk around the wall. In the direction of something that feels like the perfect fit. Exactly a year ago, I hit a rough brick wall. I was a week into my new back-to-school plan (I had already started and stopped grad school on three separate occasions). This time with an online chemistry class to knock off some prerequisites before I applied to a chiropractic program. Each time I cracked open my new $374 chemistry book I cried. Sorrowful soul-wrenching wails that made me feel like I was going to vomit. I soaked the entire 1st chapter with my never-ending tears. My boyfriend had been ignoring my calls for days. Unexpectedly a family member was in urgent care. And my schedule was so jam-packed I wasn't able to exercise or eat well OR sleep. I felt like I had hit a brick wall and had absolutely no energy left to break through it. My body was protesting and my health was waaay out of alignment. Instead of going forward, I slid all the way down that wall until I was a mangled heap on the floor. I stopped going in that direction. I made time to visit the hospital. I stayed home at night to make sure I got 8 hours of sleep. Redirecting can be just as transformational as persevering. When you quit one thing that’s not working for you, you will see 100 other things that will work for you. When I hit this brick wall and went through these steps outlined below to align my intuition-body-mind, I ended up studying in an anatomy and business program that felt like a perfect fit for me and was gaining information that was directly applicable to my career. I developed a supportive community of women through my Lovely Lady Entrepreneurs events. I felt better in my body than ever before and I had a renewed sense of confidence and pride in the ways that I was learning and growing. And most importantly, this path felt natural and energizing. 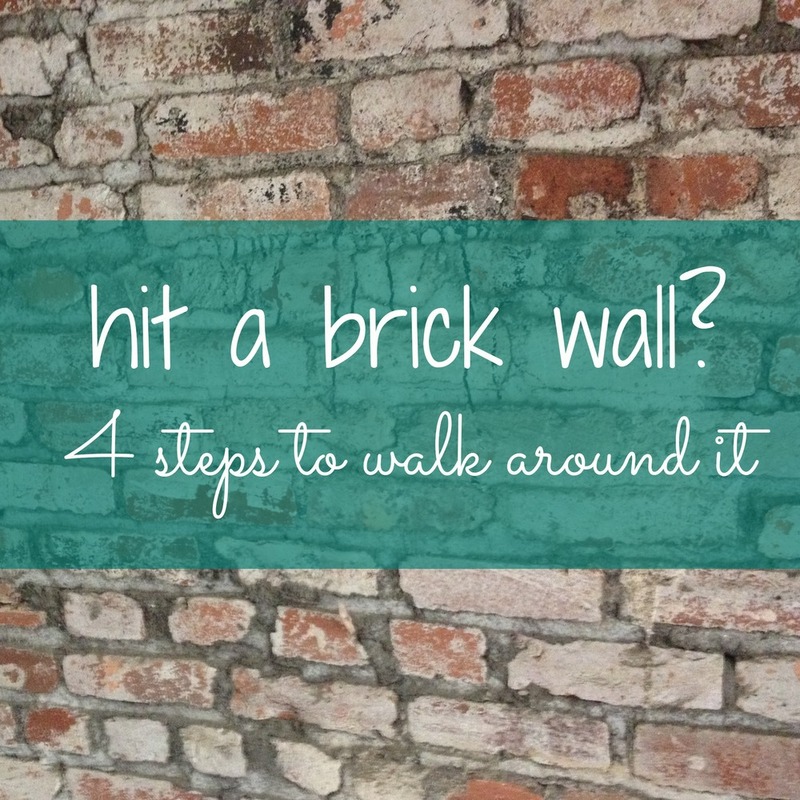 When you find yourself hitting a brick wall, use these 4 steps to walk around it. Press pause on your current situation before you hit your head against that brick wall one more time! Stop and sit quietly for a moment. Everything will still be there when you’re ready to come back to it. What are the words you’re using to describe this situation to yourself? Listen and hear the true message of your thoughts. I kept hearing myself say, “I don’t really want to be a chiropractor, I just want that knowledge.” If I didn’t really want to be a chiropractor then why was I planning on investing many years and thousands of dollars into that profession? I realized I really appreciated studying at The Breathing Project in NYC and decided to commit to studying there more intensely. What are you feeling in your body? Does your stomach contract when you think about your situation? Are you getting migraines or head colds or crying yourself to sleep? Instead of going through it, go around it! It’s OKAY to go in a different direction. Even if you’ve spent a lot of money on this path, even if you told your friends and family and co-workers that you were doing this, even if YOU thought it was going to be the end-all answer, even if you think you have to suffer to grow. I guarantee you are not a failure or lazy or a loser if you choose to go in a different direction. In fact, I think you are practicing awareness, self-discovery, compassion, and balance to be the BEST, most productive, happiest version of yourself. You are creating a body and a life that you LOVE according to what you FEEL as opposed to what you THINK you should be doing. I say, redirect and more power to you! What do you do when you feel like you’ve hit a brick wall? I'm curious to know how you deal with this. Tell me in the comments below! PS - If you feel like you've hit a wall in your fitness life, I can help redirect you on a path to health & wellness! Contact me about my new coaching and online programs! I feel like I’m now on the right track with strength training, which was my main goal, but I’ve gotten so much more from it. This has been a fantastic experience. I’ve always felt like I could be good at sticking with a workout if I only had one that I liked and that challenged me in the right ways, and now I do! I’m so thrilled that it’s flexible in the right ways (I can tailor the length to the amount of time I have, I can change the exercises to fit my needs of the day), but also structured enough to ensure I get a good workout.